There are times in life when your mind is captivated by a single thought. I suppose it begins as a small child when you learn that Christmas will soon be here. The last few weeks before school dismisses for the summer is also a time that distracts the minds of children from their studies. When a young man “falls in love” a significant portion of his awareness is always turned toward the one he loves. It is difficult for him to focus on the weighty matters in life as he pursues the heart of a young woman. As a follower of Jesus Christ the only way to remain peaceful in this world of chaos, despair and utter turmoil is to keep you mind “stayed” on Jesus Himself. Jesus said, “I will be with you, even to the end of the world,” so if you are His disciple the mountain you face in life is one that Jesus will take you over. The peace that you receive by keeping your mind on Jesus is not a game. It is the peace that comes from knowing that the Creator of the universe is dwelling inside your body and is with you as you face whatever trial you are experiencing. I recently went to see a rather high impact movie in 3D. The computer animation combined with the 3D experience made it seem as if I were actually there watching an extra terrestrial war. But because I knew that I was safely in the theater I never lost my peace at all. No matter how real it seemed I knew I was safe from harm. As life goes on the anticipation grows because either He is coming soon, or I am going. Either way I will see Him face to face. So I can let my mind go to think about seeing Him. I can be distracted by and consumed with the anticipation of hearing the trumpet or being ushered in to His presence after I die. Let the storms and the threats rage and thunder but in the blink of an eye I will see the Salvation of the Lord! For God, who said, "Let light shine out of darkness,” made his light shine in our hearts to give us the light of the knowledge of the glory of God in the face of Christ. The difference between a search light and a beacon is significant. A search light penetrates the darkness and is, just as its name implies searching for something in the darkness. A beacon enables others to see an exact location even though all around it is dark. Many people believe that the Word of God is a beacon. They believe the Bible marks the standard for truth and by looking at the Word of God you can know the exact location of God in relation to this world. But the purpose of a beacon light is to keep you from hitting it with your boat or plane. Beacon lights usually mark an area to avoid, whether it be the edge of the runway or the shallow rocky waters near the shore. The light of God is a search light. God’s light penetrates your heart and blinds your eyes to the world around you. The light of God doesn’t show you the way. The light of God is the way. The man who lives and walks by the light of this world is blind to the light of God. And the man who lives and walks by the light of God is blind to this world. The search light of God’s Word is scanning the earth today looking for those who will turn their hearts and open their eyes to stare directly into His light! When you do you will be permanently changed. Like looking straight into the sun you will be blinded to everything else. Like a blind man needs a cane to navigate you will need the Cross of Jesus Christ to safely walk this world! It is only when you are blind to this world that you begin to truly see! Listen, I tell you a mystery: We will not all sleep, but we will all be changed— in a flash, in the twinkling of an eye, at the last trumpet. For the trumpet will sound, the dead will be raised imperishable, and we will be changed. For the perishable must clothe itself with the imperishable, and the mortal with immortality. When the perishable has been clothed with the imperishable, and the mortal with immortality, then the saying that is written will come true: "Death has been swallowed up in victory." There are or will be some people who will not die! They are the followers of Jesus who are still alive when the trumpet sounds and Jesus returns to this earth in Power and Glory! It will be an ordinary day. People will be going about their business on one side of the world and sound asleep on the other. Weddings and funerals will be soon planned or already in progress. Everything that is called “normal” will be suddenly interrupted with the blast of the trumpet. Those who are looking forward to the return of Jesus will gasp “FINALLY!” And those who have rejected Him will cry out in fear. That moment may come before you finish reading this paragraph! It will be the greatest moment in human history. Suddenly, there will be the Glorious return of Jesus and you will bow down before Him overcome by His Majesty and Power! The Bible says that every knee will bow. If you love Him you will bow and if you hate Him you will also bow. The time of standing in opposition to God will be over. No one will be able to oppose Almighty God. Every follower of Jesus will see that moment. If you have already died, you will rise to greet Him. If you still alive you will be changed from perishable to imperishable. Perishable food has an expiration date and so does this perishable body. No perishable body will last beyond the return of Jesus. When Jesus returns you will receive a permanent eternal body if you are one of His! No one will ever be concerned with the decay of that body. If will always be in perfect shape and never be sick! That day will be a little like the children’s game when you hear Him shout: READY OR NOT HERE I COME! When I think about different occupations in this world, the job of carpenter is always footnoted with the fact that Jesus plied that trade with his father. But God Himself was the first TAYLOR! God made clothes out of animal skins for Adam and Eve to cover their nakedness after they sinned. When God killed the animal or animals to make clothes for Adam and Eve I wonder if He let them know that they were dying to cover the impact of man’s sin? It was indeed the first animal sacrifice and in a sense it was a sacrifice for sin. Jesus told us in Matthew 6 that God is still providing clothes for His children. Of course these verses are speaking of physical clothes and we must trust God to provide the clothing we need. But there is a greater covering that He gives to us through Jesus. Our sin left us naked and exposed. Jesus covers our sin with His own blood. We are clothed with His righteousness and our shame was borne by Jesus when He died on the Cross! Clothing is either designed to cover the imperfections in our bodies or it can be made to expose us to the world. When Jesus clothes us we become the very definition of modesty. Our need for clothing came because of sin and not wearing proper clothing promotes the continuation of lust. Jesus left the temple and was walking away when his disciples came up to him to call his attention to its buildings. "Do you see all these things?" he asked. "I tell you the truth, not one stone here will be left on another; every one will be thrown down." Jesus predicted that all of the stones in the temple buildings would be thrown down and not one would be left on another. For all of my life I have been told that this prophecy was fulfilled in A.D. 70 when the Romans destroyed the temple. There is one small problem with this interpretation. It seems that the Romans left a few stones still in place. (see http://www.livekotel.com/a_freecam.cfm?affid=25) Today those stones are called the Wailing Wall and were apparently part of those structures Jesus spoke about when he predicted their complete dismantling. In subsequent verses Jesus goes on to speak of His return to earth. The assumption has been that the taking down of the stones and the return of Jesus were two widely separated events. If some of the stones are still stacked in place then perhaps the two events are closely related. It may just be another “sign” of the return of Jesus. When you see by whatever means the stones of the Wailing Wall taken down take notice and be ready for the return of Jesus. But more importantly, be ready for the return of Jesus today. An accurate missile from some other country or a terrorist explosion could, in a split second take those stones down. So if you are looking in the Bible for prophetic references to the end of time to convince yourself that you don’t need to be ready today you are indeed being foolish. The timeline for the return of Jesus Christ can accelerate in an instant and the TRUMPET announce the arrival of the DAY OF THE LORD! Take no comfort that everything may not be ready for His return. Only take comfort in knowing Jesus Christ and in being totally sold out to being His disciple! Maranatha! When a man or woman is depressed the primary identifiable characteristic is hopelessness. Things that had great meaning in life have no significance at all when hope leaves. When there is no hope nothing else matters. A young man in pursuit of the affections of a young woman can go on for days, even years with only one glimmer of hope that someday she will receive and return his love. In total darkness one match can reveal the way and in a time of total despair one bit of hope makes all the difference. When you hope in other men, no matter how noble they may be you are always disappointed in the end. When you hope in God you will never be disappointed! When you put your hope in God your strength will be renewed, you will soar like an eagle, and you will run and not grow weary and walk and not faint. In the New Testament hope is in a list with faith and love in 1 Corinthians 13. Love is greater, but the Bible does not say that hope is of lesser value than faith. If you want to be strong and not faint, soar like and eagle, run and not grow weary and walk and not faint then look for hope. When a man buys a lottery ticket his chances of winning are extremely small, but every purchase of a lottery ticket gives the man a tiny bit of hope. Even when resources are very limited millions of people every day spend money for the hope that they might become rich! The hope you can have today in Jesus Christ will cost you everything you have, but you are not buying a chance that you may be a winner! Everyone who hopes in Jesus Christ becomes rich! Every ticket of hope you buy from Jesus is a big winner! Get yours today! Whenever Jehudi had read three or four columns of the scroll, the king cut them off with a scribe's knife and threw them into the firepot, until the entire scroll was burned in the fire. The king and all his attendants who heard all these words showed no fear, nor did they tear their clothes. Franklin Roosevelt was quite wrong when he said, “The only thing we have to fear is fear itself.” To be perfectly candid that statement would be an appropriate declaration from an inmate in an insane asylum. Analyze it for a moment. If you have nothing to fear but fear then why should you fear nothing? During World War II we had plenty to fear. The world itself was being threatened by despots who wanted to bring to an end our way of life and remove freedom from the world. So if you didn’t fear them, then why did we fight them? Today we again proclaim proudly that the world has nothing to fear as long as we come together and tackle the great problems of health care and climate change! We are taking the Word of God and fearlessly cutting it up and throwing it in the firepot. We not only disregard the Word of God but we actively ban it from every public display. Somehow we have come to believe that showing no fear of anything is an admirable characteristic. It is not. Fear is a good thing when the thing you fear should be, by all rights feared. Fearing your own shadow is foolish, but fearing a shadowy form that lurks waiting to do you harm is wise! It is better to fear everything than to fear nothing! When you fear nothing, then you don’t fear God and that is an eternally fatal mistake. So when you hear a Word from God that convicts you of your sin let the fear of God prompt you to repent. Then let the Word of God burn brightly in your heart not in the firepot! When God comes near there is no doubt about it. When God comes near there is either revival or judgment. When you are in the presence of Almighty God you either fall down in worship and praise or you fall down in fear. In either case you cannot stand before the Lord! When God comes near for revival the response among men is amazing. Men are not convinced by sound reasoning that they should repent and accept the Lord, they hear the Word, maybe even a very brief Word from God and they are overwhelmed with their need to repent! It doesn’t make a lot of sense, but a look at the history of revivals clearly shows how a revival sweeps through a culture, country or even the world. Revivals are a great leveler when it comes to rationality and intellect. When a revival comes men and women are moved to accept Jesus without regard to their education or the astuteness of their minds. When God comes near for revival you will either be drawn to Him or you will run away in horror. Do you fear God? If you do not now fear God when He comes near for judgment you will experience the fear of God in a way you cannot even imagine now! Many people today believe in God but do not fear Him. If that is your condition pray that God will come near for revival. When you are touched by God Himself and see around you the multitudes falling down in worship and praise before Jesus Christ you will be changed forever and the judgment of God will be left for those who do not fear Him! Faith without works may be dead, but works without faith is a great way to miss some wonderful blessings. I have what I believe to be a completely reasonable fear of heights. External elevators with glass walls on tall buildings bring me no joy. If I ride such a device I usually stand next to the door and purposely ignore the grand view for which the elevator was designed in the first place. The fear of heights though is really a misnomer. I am not afraid of heights, I am afraid of falling! Both Mary and her cousin Elizabeth were taken by God to heights of spiritual experience from which the view must have been utterly amazing. They not only were the mothers of Jesus and John the Baptist but they were told by God even before the birth of the babies how very special the boys would be. We can’t even imagine the conversations Mary and Elizabeth had during the time that Mary stayed with Elizabeth before the birth of Jesus, but the words of Elizabeth in Luke 1:45 probably sum up their dialogue. “Blessed is she who has believed that what the Lord has said to her will be accomplished!" The hard part for both Mary and Elizabeth was to believe God! Imagine how many times both of them were tempted to doubt that these amazing pregnancies were really as they had been told, but they were blessed because they both believed. Believing God to accomplish what He has promised is a little like watching the glorious view from the glass walled elevator as it ascends to the top floor of the building. As the Lord is taking you to the heights you close your eyes and look the other way because you are afraid you might fall! When I close my eyes in a glass walled elevator it is because I do not trust the maker of the elevator with my life. When I close my eyes to the glories around me as a follower of Jesus it is because I do not trust the Maker of the Universe with my life! When you get on the Glass Walled Elevator of God push the button for Heaven, open your eyes, look at the view and enjoy the ride! There is nothing else like it on earth. Sometimes a verse is lost in its context. Proverbs 31 is most remembered for a description of a woman of noble character. It is a notable picture of a “liberated woman” who is involved in all kinds of business ventures as well as “housewife” responsibilities. So when you speak up for those who cannot speak for themselves you find another way to image the life of Jesus Christ. Don’t champion the rights of the destitute only for their sake. Fill those shoes and walk in that path because it was the Way that the Savior walked for your sake and mine. All you need in this life is to be like Jesus! The wise men brought gifts to Jesus, but His parents gave Him gifts as well. Mary gave birth to Jesus and Joseph gave Jesus His name. Both of them were enabled to give because of what they received. Mary received from the Holy Spirit when she conceived the Son of Man. Joseph received from the angel of the Lord when he was told to name the boy "Jesus." When you arrive before the throne of Glory what will be said of the gift that you gave Jesus? Mary gave Jesus birth and Joseph gave Him a name. Have you given Jesus a few hours of your time each week, or is it truthfully a few minutes? Have you given Jesus ten percent of your income or is that number really high? Truthfully, Jesus doesn’t want your time or your money. What Jesus wants is your heart. And it is in fact a heart that He created in you. When David repented of his sin with Bathsheba he asked the Lord to create in him a clean heart. That is the heart that Jesus wants you to give to Him. If God is love then where does the wrath of God come from? How can love and wrath co-exist in One so perfect as God? The slogan “Make Love not War!” was the catch phrase of the 1960’s. Our imperfect definition of love excludes the possibility of wrath or any kind of violent action. We, like in the recent video of the speaker of the House of Representatives begin to quiver and shed tears when we speak of anything that might cause violence to erupt. But Revelation 14 says that the wrath of God is violent and bloody. It is not just a little bloody; it is the bloodiest description I have ever read. One hundred and eighty miles of a five foot deep stream of blood are the result of the wrath of God. Mine Eyes hath seen the glory of the coming of the Lord. He is trampling out the vintage where the Grapes of Wrath are stored! I began to understand the relationship between love and wrath when Linda and I were married. All of the gentleness of love was to be directed toward her, but I discovered that my wrath was ready for anyone who threatened her. When children arrived in the family circle my potential for wrath increased exponentially. I became a gentle man of peace but ready for war at the slightest threat or provocation to the objects of my love. Could it be that the wrath of God is the same? The final expression of the wrath of God will be directed at the world system that threatens the objects of His love? What can an evil man do in opposing God? Of course he can do nothing that could thwart the designs of God. What can a man do in opposing one of the Children of God or the Bride of Christ? That is where an evil man has the ability to inflict a wound and incite the wrath of God. When you attack me, I can ignore it and laugh it off. But when you attack one of my loved ones you will suffer from my wrath. When you attack God Himself there may be no apparent consequence, but when you attack the object of God’s love the blood will flow! So there is the paradoxical miracle of the Gospel. The Wrath of God was turned on Jesus for my sake. The Blood of Jesus flowed so that mine will not in the winepress of His Wrath! That is how God solved the problem of Love and Wrath and that is how I escape the Winepress of Wrath! The Immaculate Conception is rarely discussed. It is mind boggling on the one hand and perhaps even embarrassing on the other. In simple terms the Holy Spirit got Mary pregnant! That has never happened before or since. Mary was a virgin but she became pregnant by the power of God. Truthfully, Mary was the only human being who knew for sure that she was a virgin. Now here is the paradox. The proof that a girl is not a virgin is that she is pregnant. Mary was pregnant and yet was a virgin. It did not make sense and most people, including Joseph for a time did not believe her. How could Mary explain the situation? Who would believe her? The bottom line is that God sent Jesus Christ to the earth with a huge moral cloud hanging over His mother. There was no way on earth for Mary to “clear her name” with those people who knew her while she was pregnant with Jesus. It would be only if they came to know Jesus as Savior and Lord that they could see the evidence that Mary was innocent of any wrong doing. Wasn’t God concerned about Mary’s reputation? Why would God choose to let the world see the mother of Jesus as a woman of ill repute? Truthfully, God was not concerned about Mary’s reputation. He was concerned about Mary’s dedication to Him. What other people thought of Mary was of no importance to God. What God thought of Mary is the only thing that mattered. God rightly said that Mary would be “highly exalted” and ultimately she was. God is not concerned about your reputation. The fact that anyone thinks that I am a “good man” is totally irrelevant to God. His concern is focused on my dedication to Him and my willingness to submit to His will. God may even ask me, as He did Mary to be obedient to Him in a way that will cause other people to believe that I am a man of “ill repute.” What difference does that make? It makes no difference at all. Mary was willing to let Jesus Christ grow inside her body and be her first born Son. Are you willing to let Jesus grow inside your heart? The world may think you have done something wrong. But when you let Jesus grow in your heart He is not born again, you are! I make my own yogurt. Actually, I have a “yogurt maker” and I follow a few simple instructions and then I have seven new jars of yogurt. But truthfully I don’t make yogurt at all. What I do is take a bit of yogurt and put it in warm milk that has been heated enough to kill everything else that might grow in it. After it cools to just the right temperature I mix in a little yogurt with active cultures and keep the concoction warm for about eight hours. The yogurt I put in the milk grows and turns all the milk into yogurt. So as you can see, I don’t make yogurt. All I do is provide a medium in which the yogurt can grow and take over the milk! The Word of God is like yogurt. When you purge your heart of every other allegiance and let the Word of God grow inside, you are changed just like milk is changed into yogurt. Like making yogurt, when your heart is polluted with the “bacteria” of the world the Word of God will not grow and permeate your life. As Adam and Eve found out it only takes one bite of the forbidden fruit to stop the work of God’s Spirit in your life. God provides all you need of spiritual food. Stay satisfied with His Word and don’t touch the world’s pollution. If you have already touched the pollution of this world, ask God to purge it from your life so His life can grow in you and control your every word, thought and deed! The Broadway Musical “The King and I” includes a song of personal psychology. The song “Whistle a Happy Tune” says that whenever I feel afraid I should whistle a happy tune so no one will know that I am afraid. It goes on to say that I will even fool myself into believing that I am not afraid. The shallow deception of this psychology is amazingly well accepted in the world today. It is widely accepted that pretending a problem isn’t there will make it go away. It will not! A preponderance of people alive today pretend that the fear of God is inappropriate and will go away if they just “Whistle a Happy Tune” and go on with their lives ignoring Him. Eventually they fool themselves into believing that God is not to be feared. It is a little like convincing a child that he need not fear walking across a busy street. As the fear goes away, the danger, in fact increases. Without a healthy fear of traffic the life of the child is certain to end soon and tragically. Without a healthy fear of God your life will end soon and tragically as well. Listening to the One who created you and heeding His Word is the only way to navigate the troubled waters with ultimate success. When you fear God you don’t need to fear the world or the things that are coming on the world. If you don’t fear God pretending that everything will work out alright in the end is the ultimate foolishness. Without God and the fear of God nothing will be alright! But with God everything will be fine. Fearing God gives you a solid reason not to fear anything or anyone else! God wants your lips and your heart to be in sync! When the orchestra and the soloist are not at exactly the same place in the musical score the resulting sound is at first noticeable, then irritating, and if it continues it sinks to the point of being a laughable joke! If the sounds made by all of the instruments in an orchestra itself are separated by just one second you hear only noise and it is not music to your ears. A man to be praised is one whose speech is consistent with his heart. You know that the words you hear are coming from the depths of his heart and he is not a man of deception. With the coming of audio and video recordings it is now possible to hear and see the inconsistencies of people who make public proclamations. It is no longer shocking to hear a politician making a claim that was quite obviously a lie in order to gain your vote! Even public liars are not held accountable for their performances which are out of sync with the orchestra of truth! God however still desires that your words and your heart are consistent and playing the same song! When He hears your words of worship and praise He also looks at your heart. Is your worship merely words from your mouth or is it an accurate expression of the condition of your heart? Truth itself is the metronome of life by which God judges whether or not He is hearing music or noise! Listen for the Spirit of God to give you the beat for the next sound you make. Your simple life can then become part of the glorious chorus of Praise and Adoration! When I first learned the Morse code I was in my early teens. It was truly a new language and I could communicate using my Ham radio while no one around me knew what I was hearing or what I was saying. One way that I practiced the Morse code was to sound out the dots and dashes when I saw a sign while riding in a car. I was too young to drive. When I saw a sign I would try to convert all the words on the sign into Morse code before we passed it. It gave me a way to practice my Morse code skills while traveling with my parents. When you come to know Jesus Christ He teaches you the “Bible Code.” I’m not talking about the book by that name. With the Bible code you can communicate with your Heavenly Father without anyone in the world around you knowing what you are hearing or saying. One way you can practice your Bible Code skills is to apply them to the signs you see in life. As you travel through life you can look at the signs along the way and ask the Lord to let you know their meanings in light of His Word. When you don’t know the Morse code hearing someone communicate with it sounds like random noises with no meaning at all. But if you know the Morse code the meaning is clear. If you don’t know the Bible Code hearing someone communicate with it sounds like random or even foolish noises with no meaning at all. If you know the Bible Code, sound out this sign: “The virgin will be with child and will give birth to a son, and will call him Immanuel.” This is the impossible reality that God is with us through Jesus Christ! When you feel strong you can believe that you are with God, but when you are weak you must know the Immanuel truth that God is with us! Others may hear just noise, but we can hear the heartbeat of Jesus!
" 'I the LORD have spoken. The time has come for me to act. I will not hold back; I will not have pity, nor will I relent. You will be judged according to your conduct and your actions, declares the Sovereign LORD.' "
When a Tsunami approaches a coastline there can be a phenomenon called “drawback.” Before the wave hits the water pulls away from the shore leaving the sea bed dry and luring the curious into the trap of a watery grave! So now you know that if you see the water receding from the beach it is time to run as fast as you can the other direction and look for high ground. Higher ground is your only hope of not being swept away in the Tsunami that is approaching. If you are at sea when the Tsunami passes your location you may not even feel the wave go by. Because of the depth of the water a huge Tsunami may only feel like a small wave. So truthfully, the safest place to be when the destructive Tsunami hits is out in the deep water. Like a Tsunami in the ocean the judgment of God is coming on the whole earth. There is no escape. God’s justice is perfect and His judgment is certain. Only those who depend on Jesus Christ will be spared from the wave of destruction that is coming. On that day the sky may be blue and the sun shining brightly when the “drawback” starts and your curiosity pulls you even more into harm’s way. If you can hear the warning now, it is time to run for the higher ground of Jesus Christ. It seems the drawback is already starting and things are being exposed that have never been exposed before. Run to Jesus! Let him lift you high above the danger. If you are already in the deep water with Jesus rejoice that being in the depths with Jesus is the safest place to be in the Tsunami that is coming. Don’t be tempted by the drawback and lured out into the now dry seabed as you study things that have never before been exposed. God’s Tsunami exposes the corruption and then washes it away! Your job is to run for higher ground! The first year my son played high school football, we were invited to attend the “Football Banquet.” I think the appointed time was 6:30 pm and we arrived ready to eat! There was no food! Somehow over the years it was decided that it was too much trouble to feed all those people so the meal disappeared but the name stayed the same. Satan invites you to a banquet but when you arrive, hungry and ready to eat there is no food! The story of Joseph in the Book of Genesis is filled with symbols that point to Jesus and the Christian experience. Slavery, suffering, crossing the Red Sea, and freedom in the desert for years while waiting to go in to the Promised Land are all part of the whole story that begins with Joseph being sold into Egypt by his brothers. For God to accomplish His purposes He withheld the harvest for seven years after seven years of plenty. The lack of food motivated Jacob and his sons to move to Egypt where they grew into a nation. Suffering brought them to Egypt and suffering returned as they became slaves before they were led out by Moses. Comfort is no motivator. Having your desires satisfied usually does not precede action and accomplishment. If you want your son to become a great fisherman give him hunger not a better fishing rod! It is All About Jesus! Jesus answered, "I tell you the truth, no one can enter the kingdom of God unless he is born of water and the Spirit. Flesh gives birth to flesh, but the Spirit gives birth to spirit. You should not be surprised at my saying, 'You must be born again.' The wind blows wherever it pleases. You hear its sound, but you cannot tell where it comes from or where it is going. So it is with everyone born of the Spirit." We all know what it means to be born as a natural man. But what does it mean to be born as a spiritual man? If you are to enter the kingdom of God you must be first born as a natural man and then you must be born of the Spirit! When you were born of the Flesh you first had been conceived by your father and mother as they were united as one flesh. The miracle of your life was none of your own doing. You were not there until it happened and even after it happened your awareness and understanding was very limited. When you were born of the Spirit you first had been conceived in the mind of God by the Spirit. The miracle of your spiritual life was none of your own doing. The Love of God, the sacrifice of Jesus Christ, and the Spirit Himself came together to bring you to the point of birth as a spiritual man! You played no more role in the conception of your spiritual life than you did in your physical life. But what about the choice I made to love and follow Jesus? Isn’t that part of the picture when I become a child of God? When the Bible says “All have sinned and fall short of the Glory of God” isn’t it recognizing a position from which you fall. It is difficult to grasp, but consider carefully this concept. All men are conceived of the Spirit, but not all men are born of the Spirit. The Spirit desires that every man, woman, and child who has ever lived be born again! It does not happen. That is why abortion is such a great evil in the world. Physical life created by and conceived by God is aborted before birth. The love of God provides that everyone born of the flesh might also be born of the Spirit. When you accept Jesus Christ you simply choose not to abort that process. Your new birth is by His decision and His power. Your testimony is not about you. Your testimony is about how you were born again because of Him! It is all about Jesus! There is much controversy and even bitterness about the President of the United States apologizing to the rest of the world for things that we have done to offend. Why should we ask forgiveness when we have been perhaps the most effective deterrent to tyranny the world has ever known? Our generosity in times of crisis is legendary. But what about our national sins, can a nation sin against God? When people join together and call themselves a nation and then establish laws that are directly contradictory to the Word of God it is sin. Revelation 18:4 speaks of national sins. Offenses may be irrelevant but sins are not! Even as in a court of law the question is not how humanitarian is the criminal. The question is did he commit the crime and what is the prescribe punishment. The judgment of guilt or innocence cannot be based on who you are or what else you have done. The advice in Revelation 18 is that God’s people “come out” of such a nation so that they will not share in her sins or receive her punishment. We have been more focused on avoiding the punishment and less aware of what it means to share in the sins of our nation. If you want to know if you are “sharing in the sins” of your nation here is a good first step. Get a piece of paper and write down the top ten sins of your country. If you can’t think of ten can you name five? What about three? Ok, let’s just name the greatest sin of this nation. If you can’t name the sins of your nation then it is likely you are participating in them yourself. Ask God to show you how your country is sinning against Him and determine to leave the party before the fire falls in judgment. If you have no fear of heights, hot air balloons are an exciting endeavor. Up, up and away in your beautiful balloon! If the wind is blowing gently you will peacefully go with the flow until it is time to find a place to land. If the wind picks up the hot air balloon experience can quickly become a terrifying and even fatal ride. I prefer flying with someone controlling where I am going. Life itself for some is like a hot air balloon ride. It is exciting enough at first and the view is beautiful. Like a balloon ride you have no idea where the wind is taking you! At times, like a balloon ride in a storm life can be terrifying and even fatal. When you get to the end of the ride you have no idea why you arrived at that destination since all you could do in this life is to make the best of where the wind took you. When you become a follower of Jesus Christ you step out of the drifting balloon and become a pilgrim. Followers of Jesus are not just blown about by every wind that comes their way. Christians are on a journey. It is a journey that will end when they stand before the throne of God in Heaven. Like Peter stepping out of the boat in a storm, Jesus calls us to leave the gondola and let Him take us on our Pilgrimage to Glory! This is what he showed me: The Lord was standing by a wall that had been built true to plumb, with a plumb line in his hand. And the LORD asked me, "What do you see, Amos?" Then the Lord said, "Look, I am setting a plumb line among my people Israel; I will spare them no longer. Gravity is an amazingly reliable force. Gravity pulls everything on earth toward the center of the earth. For as long as men have been building walls and buildings the force of gravity on a plumb line insures that the construction is perfectly vertical. 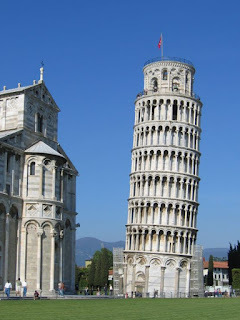 The Leaning Tower of Pisa is a famous example of a structure that is not plumb. Construction on the Tower began in 1173 and had only three floors when it started to lean. But in spite of that fact the construction went on for 177 years. The reason the Tower of Pisa became the Leaning Tower of Pisa is that the foundation was poorly laid in unstable sub-soil. Over the years and as recently as the 1990’s extensive efforts were made to keep the tower from falling. As God overseas the building of my life and yours there is the plumb line of His Word. When I stray from the Word of God my life begins to lean precariously. If I continue to build with my life “out of plumb” I will fall. As your continue to grow in the Lord it is crucial that you check the plumb line of His Word and make sure that you are not becoming a leaning tower. Never forget there is no tower that is too tall to fall! "My prayer is not for them (the disciples) alone. I pray also for those (us) who will believe in me through their message, that all of them may be one, Father, just as you are in me and I am in you. May they also be in us so that the world may believe that you have sent me. I have given them the glory that you gave me, that they may be one as we are one: I in them and you in me. May they be brought to complete unity to let the world know that you sent me and have loved them even as you have loved me. According to one dictionary definition Glory is the fame, admiration, and honor that is given to somebody who does something important. Is this admiration caused by Jesus or given by Jesus? Does Jesus cause others to admire us or does He admire us? The almost unimaginable truth is that Jesus Himself gives us Glory! My father was a man of few words. My verbosity was taught by my mother. But my father paid me a ten word compliment once that I will never forget. It was in fact so precious that I must not share it here or I will get completely side tracked just thinking about it. When a parent sincerely admires a child it gives the child a Glory that cannot be matched except by Jesus Himself. If you are a disciple of Jesus Christ and are His child He has given you Glory! Jesus likes you. Jesus appreciates you. Jesus is proud of you. Jesus wants to be with you. A good parent enjoys spending time with his child. Jesus Christ wants to be with me. It gives me joy to be with Him, but it also gives Him joy to be with me. The love that I share with Jesus is not a one way street. I give Him Glory, but according to John 17:22 Jesus gives Glory to me! I frankly do not grasp this truth. It is beyond my poor ability to understand, but I can by faith know that Jesus is pleased with me. Of all the things that might encourage a man on earth this is the greatest! Jesus loves me and admires me! I must not forget that His admiration is not because of what I have done or will ever do. His admiration for me is because I love Him even as He has loved me! The depth of Jesus love for me makes the deepest ocean into no more than a drop in a bucket! Praise Him Forever!